The technology used to create audio amplifiers has gone through changes and advancements. Rockville, the renowned manufacturers of audio devices and systems, has all along taken up the responsibility of keeping consumers up to speed with the growing technology. Rockville brings to the market car audio systems and devices that are not only high quality and sleekly designed but also at incredibly unbeatable prices. This is one of the reasons the company created the Rockville RXH-F5 car stereo amp. 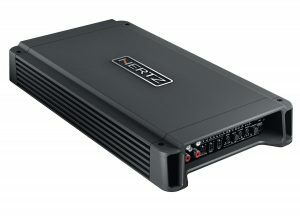 In this Rockville amp review, we are going to look into the features, pros and cons of the Rockville RXH-F5 5 Channel Amplifier car stereo amp and come up with our final verdict on the worthiness of this product. 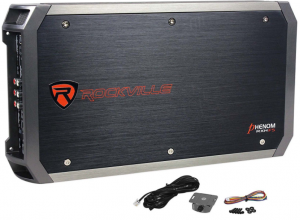 The Rockville RXH-F5 car stereo amp weighs 10 pounds and measures 4 x 20 x 10.5 inches. Like every other Rockville professional gear, this product is conceived and developed in the United States. It comes with a CEA certificate of compliant power ratings of 4 Ohms: 550 Watts (4 x 50 Watts + 1 x 350) at 4 ohms and 1% THD+N 2 Ohms: 800 Watts (4 x 75 Watts + 1 x 500) at 2 ohms and 1% THD+N. The RMS power ratings of this product are 4 Ohms: 1100 Watts (4 x 100 watts + 1 x 700 Watts) and 2 Ohms: 1600 Watts (4 x 150 watts + 1 x 1,000 Watts). It has five channels where channel 1 through 4 are class A/B and channel 5 is mono class “D”. It costs $299.99 and comes with a 4-year warranty. You will have to admit that the Rockville RXH-F5 is quite affordable. Given its key features, this product is arguably the most affordable in its class of car stereo amps. According to one Rockville amp review, it’s hard to find a five-channel car stereo amp that flashes a below-$300 price tag and still delivers the same way the Rockville RXH-F5 does. For this reason, we can actually say that in terms of pricing, this product carries the day. The only extra expense that one is likely to incur, although it’s not mandatory, is the cost of the Soundquest SQK4ANL CCA 4 Gauge Wiring Kit. Although these two are frequently bought together, the wiring kit is not that important because the Rockville RXH-F5 comes with its cables and connectors as part of the package. The other advantage of the Rockville RXH-F5 is the fact that it delivers stable tons of power for a long time. According to one Rockville amp review, this product actually drives some nice speakers even at medium volume levels. As a matter of fact, you cannot turn the volume all the way up because it will be too loud. This is because of the high and stable power that this amplifier drives to the speakers and subwoofers. Another Rockville amp review applauds the Rockville RXH-F5’s ease of use. Not only does it sound good but it is also incredibly easy to tune. The extended warranty is a plus for the Rockville RXH-F5 as it allows users to push the product’s limits. The Rockville RXH-F5 is easy to install if you know what you are doing. For a standard car installation, the product manual is pretty self-explanatory and easy to follow through. The channels distribute the power to different peripherals (subwoofers and speakers). Also, given the ease of tuning, this product guarantees you the best sound ever. According to one Rockville amp review, the Rockville RXH-F5 sounds amazing and does not produce crazy loud noise. With the right connection of speakers and subs, this product brings out the complexity of the music you listen to. It also guarantees high levels of satisfaction by ensuring that your car system sounds very clean and crisp. The major downside of the Rockville RXH-F5 is the overheating problem. One Rockville amp review actually claims that the heat produced after setting up the wiring is enough to cook an egg. The amp overheats even when everything about the wiring is okay. This is basically because of the high power that the amp delivers to the speakers and subwoofers when connected. When this amp gets very hot, it creates a disgusting discomfort in the car, which kind of ruins the comfort. Also, when the amp overloads it literally goes into error mode and won’t turn back on until power is removed and reapplied, which does not make any sense. The Rockville RXH-F5 is definitely a great deal if you are looking for a car stereo amp that fits the budget. 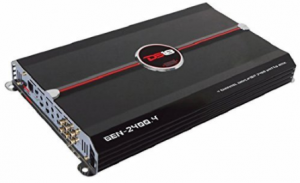 It has high-quality features that make it stand out among other five-channel car stereo amps. The sleek design and the solid build both give this product the superiority of market dominance. Except for the overheating downside, the Rockville car stereo amp actually fits the bill for an excellent audio gear.